This past week we spent some time in Southern California which is where we both went to college. Inevitably, this involved some hiking in the beautiful hills of Laguna Beach. 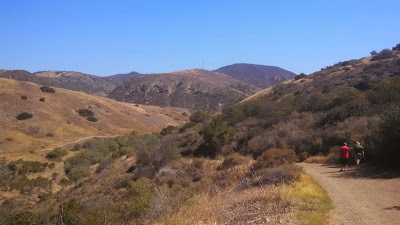 The El Moro Canyon Loop was a nice 4 mile loop with great views of our old home. Hills have become somewhat of a thing of the past with our life in Chicago. There's a few hills here and there but nothing as stark as those of California. One of the things I've always missed since I moved from So Cal out east is the abundance of trails. I used to run the trails of Laguna and Crystal Cove nearly 3 times per week and I suppose that was the genesis of my long-distance running career. I remember being able to run over 20 miles without ever touching pavement here. 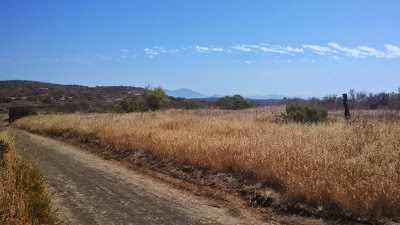 Naturally, with our nostalgic tour of old college haunts, we were drawn to El Moro Canyon. 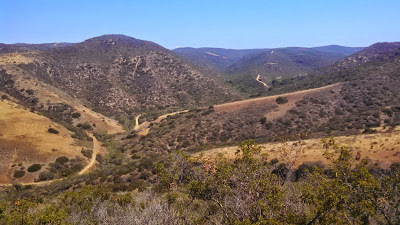 This is a very nice 4 mile loop that takes the hiker pretty deep into the Laguna wilderness without too much difficulty. It has some bigger hills but rewarding views of the sparsely populated El Moro coast. The trail is easily hiked in 1/2 a day but can also be mountain biked. In fact, this is really the premier mountain biking destination of Southern California. The singletrack of Aliso Canyon is some of the finest I've ridden in the state. But we were happy with our pleasant stroll. The trail walks through the bottom of the canyon which is quite lush, by So Cal standards. The flora is much greener and taller given that its so close to the seasonal creek. Of course, this year there was hardly a drop of freshwater in sight! Nevertheless the robust trees kept the trail shady on this hot spring day. Wandering further into the canyon, we found our fork which takes up the prominent El Moro Ridge. Its steep and sustained but the coast unfolds as you gain elevation. The higher hills of Laguna become overshadowed by the distant mountains of the Santa Anas. The infamous Saddleback Mountain loomed over South Orange County and I was reminded of all the adventures I've had climbing that mile high mountain. From the effective summit of our ridgeline, I could also see well across the straight to Catalina Island, another place which evokes so many happy memories for me. 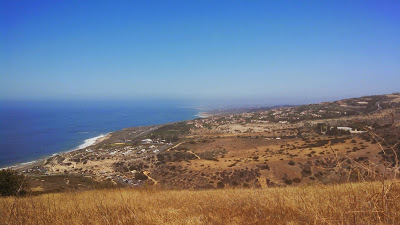 The views from the El Moro ridgeline were like looking through an old photo album for me. The trail descended down to Pacific Coast Highway and we reminisced about our college days. We laughed thinking that our young twenties were spent with much more memorable times such as these rather than the typical drunken affairs that permeate most college experiences. Back at the parking lot with 4 miles done in just over 2 hours, we decided to cool off in the ocean. Despite the 80 degree temperatures, we were instantly reminded that the Pacific Ocean is just about as cold as Lake Michigan this time of year. Nevertheless, it was fun to play in a large body of water which actually had salt and waves.